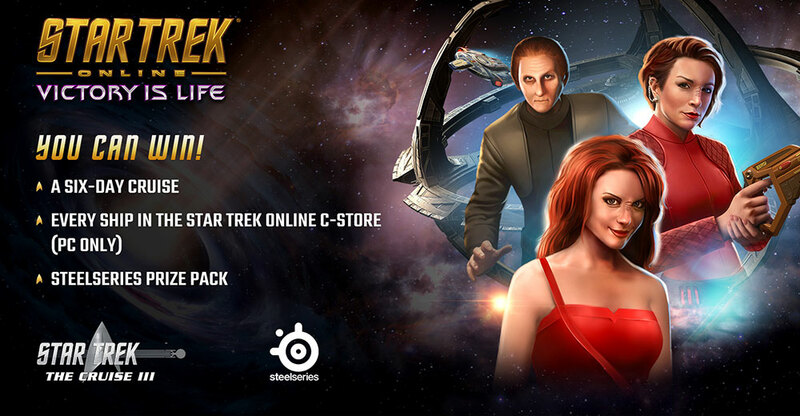 Win a Cabin on the Star Trek Cruise, and Every Ship in the C-store! Is there anything better than getting the chance to hang out with your favorite Star Trek actors? How about getting to hang out with them while on a completely relaxing Caribbean vacation? That’s the experience you’ll have on Star Trek: The Cruise III, beaming out of port January 2019 on the Norwegian Jade. Hang out with STO alum like Michael Dorn, Denise Crosby and Robert Picardo, and meet the members of the cast of Victory is Life, like Chase Masterson, Rene Auberjonois, and Nana Visitor! It’s a Star Trek experience unlike any other this side of the Gamma Quadrant. Enter below, and you’ll also be entered to win our second place prize, which is a SteelSeries Arctis 5 Headset and a Defiant Bundle, and our third place prize, which is the Defiant Bundle and a SteelSeries Arctis 3 Headset! Celebrate your love for Deep Space Nine by flying your favorite “little” ship. Please see here for the terms and conditions. Enter now, and we hope to see you on the high seas!